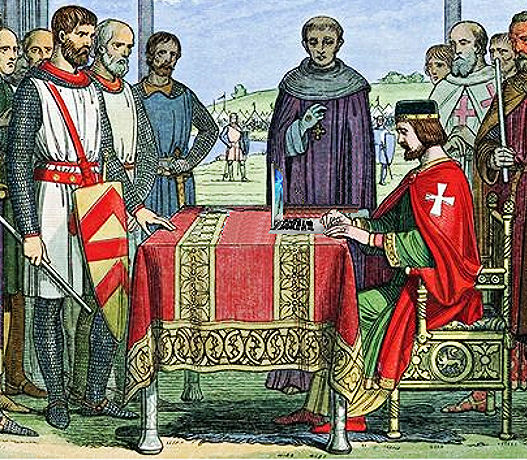 The year 2015 marks the 800th Anniversary of the signing of the Magna Carta by King John. The Magna Carta, or the Great Charter of Liberty, is widely viewed as the foundation for individual liberties and the rule of law. The history of the document is storied and murky, including multiple reaffirmations of the principles by monarchs facing an unhappy ruling class and the annulment of the Charter by Pope Innocent III. However, the concept of the liberties outlined in the Magna Carta has persisted through the centuries, particularly in America and Great Britain. America’s Founding Fathers looked to violations of the rule of law by the British king as justification for founding a new country. These ideals of freedom and democracy echo in the Universal Declaration of Human Rights and the European Convention of Human Rights. Even 800 years later, we are still learning about the Magna Carta. Researchers at the British Library preparing for the anniversary recently discovered an account of the sealing of the Magna Carta at Runnymede in an obscure medieval work known as the Melrose Chronicle. If you would like to learn more about the Magna Carta, Georgia State Law’s Professor Rowberry is organizing a CLE symposium for the Georgia Bar on the meaning of the Magna Carta and its relevance to Georgia. The event will be Monday, March 30, 2015 from 8:15am to 3:00pm at the State Bar of Georgia Conference Center, 104 Marietta St. NW, Atlanta, GA 30303. Symposium attendees will also get to view the American Bar Association’s exhibit on the Magna Carta. More details on the CLE will be available in mid-February. Check the seminar schedule on the ICLE website for more information.